Simon Kerr on Hedge Funds: Excess Supply of Emerging Managers to Come? Excess Supply of Emerging Managers to Come? One of the consequences of the growth of institutionalisation of the hedge fund business is that it has become a lot harder for small and start-up hedge fund managers to get commercial traction. In the late Nineties it seemed that a manager only had to turn up with a credible background and they could launch with $30 to 50m. In the early Noughties it was still fairly easy to set up and it was quite common for a large wealth management company or fund of hedge funds to put a manager they believed in into business. From 2003 onwards the bar was raised for start-ups – managers had to come to potential backers with much more of a complete package, including a preference for two portfolio managers and an analyst or two. "We expect start-ups to have a headcount of five or six," was a typical quotation at the time. It was not impossible to get going on either a bigger or smaller scale, but if it was smaller it was odds-against. In the period 2005-2007 asset flows into the hedge fund industry became the dominant driver. The consequences included a break-away pack of winners amongst allocators of capital to hedge funds. The flows of new capital were dominated by institutional assets such that institutional imperatives dominated the processes and mind-sets of funds of funds businesses. Ticket sizes became bigger generally. And this was a problem to new and smaller funds – as investors in hedge funds commonly have prudence rules that limit the percentage of assets of a fund they can represent. In this era the second generation manager was the most successful route to hedge fund launches. This was a very safe route for the middle men of the business – as many more of the boxes could be ticked at launch, particularly if the second generation manager stayed under the same roof. The same can be said where additional strategies were launched by the management company for a successful large hedge fund. Times since the middle of 2008 have been tougher for newly launched funds. There were far fewer of them, but redemptions across the industry made things very difficult. The outflows of capital across all funds left capacity at great and very good managers. Logically the first flows into the industry went to the best managers with available capacity, which was all of them. Late into 2009 the word was that the reining back of capital at investment banks, but across the sell-side generally, was going to compel an outflow of talent into the hedge fund world. Investment management consultancy Laven Partners have said that they are seeing a trend for traders from banks to launch new businesses, partly reflecting concerns about remuneration levels within banks. They say that many traders working as the number 2 or 3 portfolio manager in a fund feel that now is the time to strike out on their own. In particular this is true in funds that are well below their high water mark. Other service providers confirm the trend - prime brokerage departments were said to be running longer lists of newly formed funds coming to market. For example Morgan Stanley reported a 10% increase in prime brokerage clients in the 4th quarter. So 2010 is expected to build on the recovery in launches of the second half of 2009. Anecdotal evidence suggests that for Europe at least, the first half of 2010 will be a busier again for new launches. Three quarters of Europe's hedge funds are in the U.K., and in the U.K. the management companies of the investment advisor have to be approved by the F.S.A. Start-up consultancies say that they have a good pipeline of new and completely independent managers, and the workload at the FSA confirms this. In early 2008 I was involved in a fund launch, and the authorisation part of the process took around 4 weeks with the F.S.A. Whilst it is true that the FSA is subjecting applications to greater scrutiny, that firms are being told by the FSA that applications are piling up, and that the average processing time is approaching 12 weeks, reflecting an increasing number of fund management company and fund launches. Rob Mirsky of Laven Partners told me that the FSA is certainly still backed up - even getting a case officer at the FSA at the moment is a struggle, he says. So what kind of demand environment are these management companies and new hedge funds going to launch into? 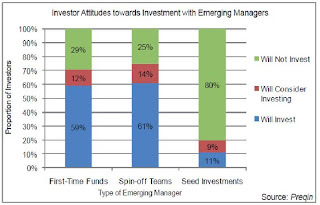 Alternative investment data specialist Preqin surveyed investors in hedge funds in the last couple of months to find out about their attitudes to emerging managers. The Preqin survey suggests that only 29% of investors would consider investing in a hedge fund with less than $100m in AUM. Further, they suggest that, in the main, funds of funds are the only investor type to get involved. So a principal difficulty faced by emerging managers is that they are mostly trying to attract capital from a type of investor that remains under commercial pressure itself because of its own investment returns and capital flows. Flows at the industry level, having turned positive in April/May of last year, have reversed in the short term. After seven straight eight up months up to November last year, flows turned negative in December 2009, according to HFN. In October investors committed $16bn of new capital to hedge funds, and in November investors subscribed a further $26bn. However, in December investors redeemed $4bn from hedge funds, according to analysis of the HFN database. Given the emerging bear phase in equity markets, it is not expected that capital flows into hedge funds will resume with force until later in 2010. Industry level flows can be very important to new funds. Funds of funds went through a lot of fire-fighting in the second half of 2008 and the first half of 2009. The senior staff that have the ability to make seeding decisions or can decide to back an early-stage manager were completely occupied with existing investments (and keeping their firms afloat) during that twelve month period, and only emerged with some degrees of freedom in their management choices very recently. When industry flows are consistently positive again funds of funds will be able to get on the front foot in decision-making. In the aggregate, funds of funds have barely had any positive flows yet, even when single managers were gathering assets again in the second half of 2009. So the major source of capital for small and new hedge funds has been, and will continue to be, constrained for capital and senior management time in the first half of 2010, with a few small exceptions. The small exceptions are funds and funds of funds that seed and invest in new managers on a dedicated basis. Seeders have been making capital commitments, and are well invested - many are looking to raise additional capital before they can back any more new funds. There are some new entrants: United Investment Managers and Aptima Capital Management have both recently announced plans to launch fund of hedge fund vehicles focused on emerging manager hedge funds. They should both have plenty of choice, at least in Europe. Addendum I: according to magazine AR, the assets garnered by new funds declined 36% to $14.89 billion in 2009 —the worst showing in years. In total, new funds in 2009 that were managing a minimum of $50 million in assets by year-end amassed a mere $14.89 billion, the lowest on record, according to the biannual survey by AR, which has been tracking the biggest new fund launches since 2004. That is 36% less than $23.17 billion in 2008—a figure that was helped by two mega launches from Goldman Sachs that raised a combined $7 billion—and 63% less than in 2004, when assets garnered by the biggest new funds peaked at $40 billion. While the number of new fund launches in 2009—53 funds met AR's criteria for inclusion—came close to those in 2008, the average assets are lower, and the number of funds managing more than $1 billion has collapsed. Only two funds were able to end 2009 with $1 billion in assets or more, as compared with 2008, which boasted five funds managing that amount. Very interesting. Thank you for posting this piece.